AmeriGlide Announces the new Rave Stair Lift! 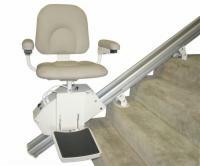 The AmeriGlide Rave sets a new industry standard in stair lift quality and customer convenience. Experience the best and forget the rest! We offer new and reconditioned models of the Rave right here on our website, so you can choose the option that best fits your budget and long-term needs. Contact a mobility specialist today to order your AmeriGlide Rave!